How do Collaborator Licenses work? As a UX research platform, we're always seeking to provide the best possible experience of our own product. When we first introduced paid plans, we thought that the easiest and fairest model for charging customers was to simply charge for each paid member (the owner and collaborators, not observers) that they have in their organization at the beginning of the billing cycle (e.g. yearly). However, we noticed that this caused confusion and unexpectedly high bills for some organizations that added many collaborators and were unaware of the cost. Also, it can be hard for the owner or finance admin to control who is adding paid members. For this reason, we've decided to introduce Collaborator Licenses. 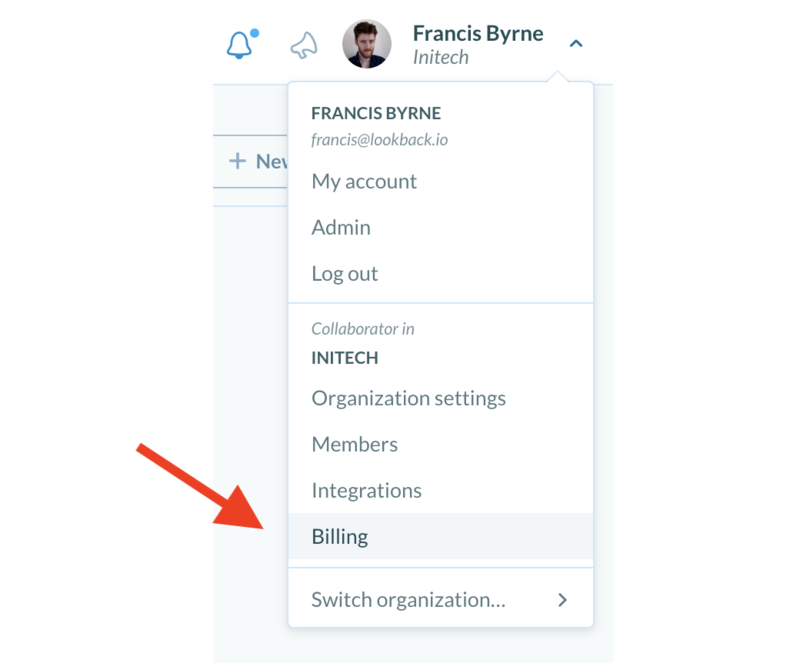 These will make it clear when you are making a purchase in Lookback (which will increase your recurring bill), and it will allow you to control the number of paid members in your organizations to avoid breaking your budget. Whilst on a trial, you will be able to add as many collaborators and observers as you want. When your trial is over and you've invited the collaborators you want in your organization initially, you can subscribe to a paid plan, purchasing the number of Collaborator Licenses equal to the number of collaborators in your organization. This license number will then become the upper limit for the number of collaborators (including the owner) that are allowed to join the organization. In order to add collaborators to your organization, or promote observers to collaborators, you'll need to make sure you have available licenses. Observers do not require individual licenses for Starter and Pro plans. Only the owner and collaborators in your organization require licenses, on those plans. Confused about collaborators, observers and owners? Read about them here. When you are on a paid plan (not a trial), you can view your licenses on the billing settings page and add more if needed. When adding licenses, you can choose any number of new licenses, and you will be able to review the total cost of the new licenses before purchasing them. Once confirmed, you will be charged a prorated amount for the remaining days left in your current billing cycle. You can also remove any unused licenses in your organization. For instance, in the above screenshot, you can remove the two licenses that are not being used. The result would be that there are now 4 total licenses in the organization. You cannot reduce the total licenses below the number of collaborators in your organization; to reduce it further, you will need to remove collaborators, or demote them to observers. 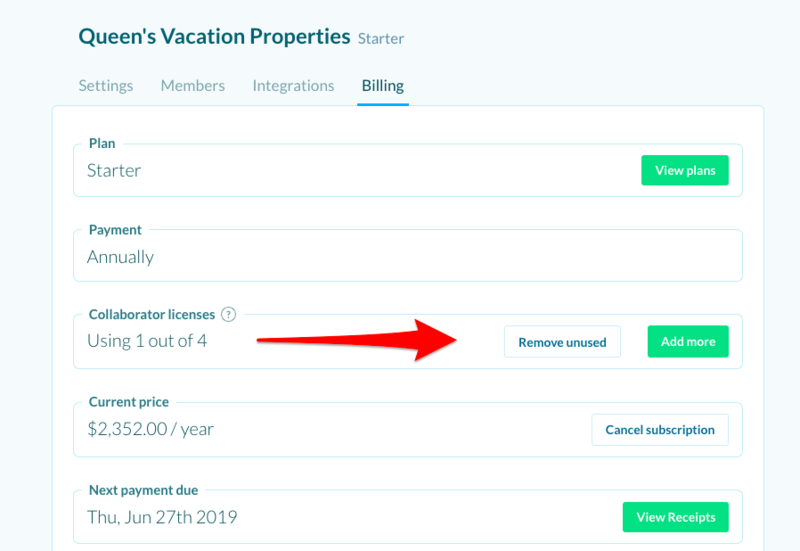 You will not receive a prorated credit for the discontinued licenses, but the reduced total cost (4 x collaborator) will be reflected in your next recurring payment. For this reason, you may choose to reduce the number of licenses towards the end of your current billing cycle, to maximize usage. The next payment date is visible on the billing settings page, as seen in the screenshot above.